There's something very special about gardens by the sea, and three of the best seaside gardens I've seen this year happen to be in Cornwall, so you could combine them all in a single trip. Each is unique and if you make the effort to get there, you'll be really surprised by what you find ... even if it is a long way to go! 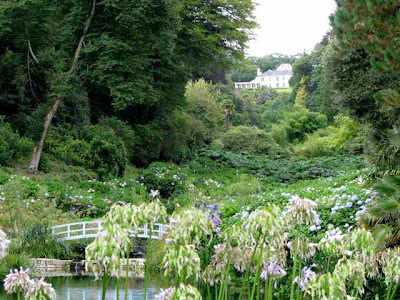 Trebah is my first garden today - a magnificent 25-acre garden - incorporating a wild, sub-tropical ravine - overlooking the Helford River, with the tallest Chusan palms in the UK. It's a fantastic landscape, particularly in April at rhododendron time when you will wonder if you have actually gone to heaven - so spectacular are the colour displays! But don't worry if you can't get there for this spectacle, there are also incredible tree ferns, bamboos and wonderful walks down to the sea. There is something in bloom here year round. 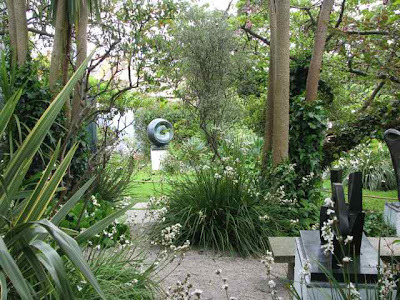 The Barbara Hepworth Museum and Sculpture Garden at St Ives is another "must-see" if you're in the area. This is a tiny garden, with spectacular architectural plants, which provide the backdrop to Dame Barbara's magnificent sculptures, displayed to full advantage in this peaceful haven, just minutes from the Tate Gallery's provincial outpost. If you get this far, you'll also have the chance to explore St Ives, which still retains its charm, even if it has been ravaged by tourism. But prepare yourself for some steep hill climbing, because the entire village perches on the edge of the sea, and to discover all its wonders, you will be climbing some steep gradients - not for the feint-hearted! And for me this garden will always hold a special place in my heart, because I used to visit regularly with my father in the last years of his life. We'd head out for a whole day in St Ives ... and were never disappointed. 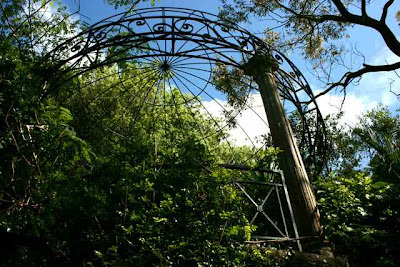 Lamorran House is another of my Cornish favourites - a south-facing, 4.5 acre garden overlooking the sea on the Roseland Peninsula, with its own microclimate - and filled with sub-tropical plants, as well as a fine collection of camellias, rhododendrons and evergreen azaleas. 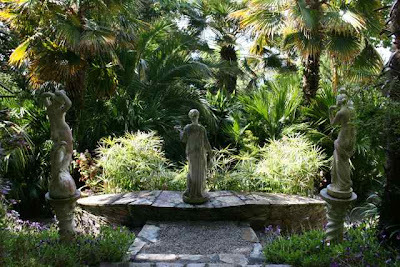 This garden is full of surprises and a fine collection of statues (not Barbara Hepworth style, but classic Italian), and you'll be amazed how much is packed into such a small space! 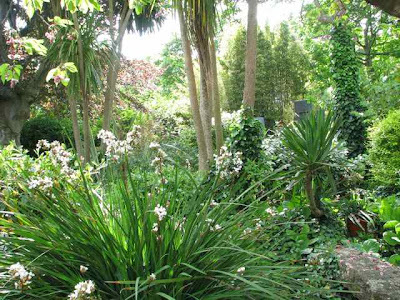 The dense planting makes this garden really special and you'll find yourself completely at peace as you wander up and down the pathways, enjoying watery views out to St Anthony's Head. Just a word of caution though - not suitable for anyone who's not steady on their feet, as the garden is on quite a steep hillside, with many steps. Of course there are many other beautiful seaside gardens in Cornwall, including Caerhays, Glendurgan and Carwinion to name just a few. A great website to check garden details in any vicinity is Garden Visit, which also has excellent maps and website links that will help you plan garden trips worldwide. I think we're overdue a trip to Cornwall - Ihaven't been for years. 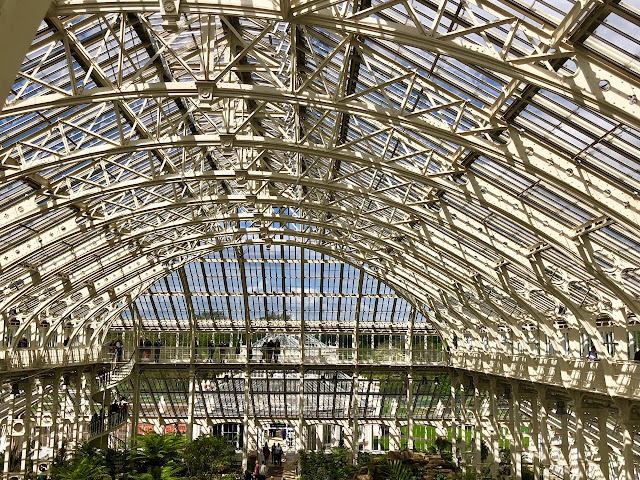 So many gardens to visit there. Another wonderful selection. Lammoran House with its densely planted gardens looks absolutely wonderful. I'm all about densely planted spaces after all! Let the show continue forward! Charlotte, More stuff for dreaming. (Though now I have that nursery riddle stuck in my brain: As I was going to St. Ives, I met a man with seven wives...) Cornwall is one part of the UK I've managed to miss out on, but have wanted to see ever since our grandmother sent us a Rupert annual one Christmas. Thanks for the pic-tour. I had the privilege of visiting Trebah and Lammoran this past June. They are spectacular. Cornwall is a lovely place. I would love to go back. 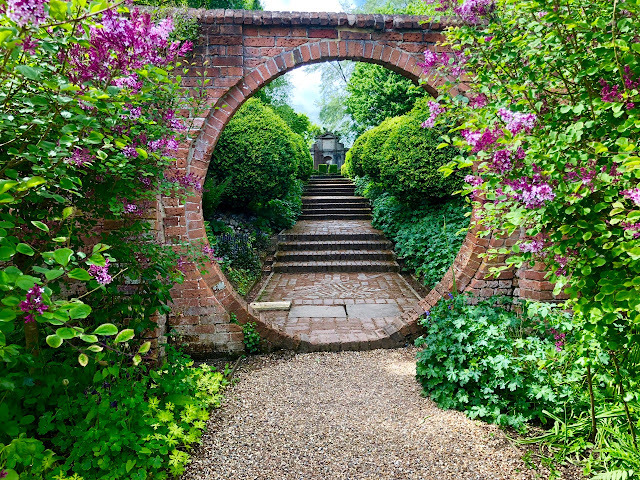 How lush and beautiful and to think the sea is only steps through each of these enchanting gardens! Thank you Charlotte! Charlotte, Happy New Year 2010! I like this blue/green colour scheme. Your features of fresh, green and blooming plants is a wonderful way to start the year. Cheers! It's been a decade or so since I finally arranged a visit to St Ives and to Hepworth's home & garden. I missed Lamorran House, sad to say. I'm planning a garden trip to Cornwall for the spring and was very glad to find your listings. Thank you.